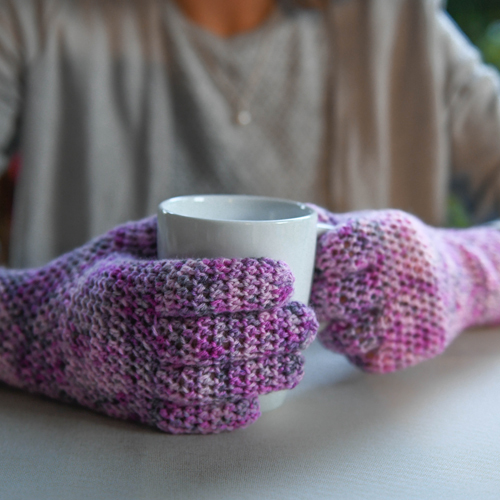 Crochet a pair of EasyFit Lite Gloves (or Mitts) to keep your hands warm, while showing off the stunning yarn you purchased… ideal for those hand-dyed sock yarns we all love to buy! Customization instructions included, because everyone’s fingers are different! See the links below this listing – most of the “EasyFit” patterns were designed for DK weight yarn, and the overall concept has been made many times by Fiona Langtry, the designer. The EasyFit FingerTip Gloves – provided in both Sock and DK yarn options, these are perfect for bloggers, students or musicians who just need their fingertips free. The “EasyFit Deal’ – purchase more than 1 of these patterns to be eligible for progressively increasing discounts automatically applied at checkout. As featured in the LoveCrochet Newsletter, 18 December 2018! It’s supremely exciting to be featured in such a prestigious newsletter! OH and if you want to buy some yarn, please click the image below – it’s my affiliate link and I receive a tiny commission for each purchase. Want your EasyFit Lite Gloves or Mitts made for you??? Many of the pictured gloves will soon be available, ready to ship (and made to order) from my sister site, HERE – my VIPs have first selection, so sign up today!